As announced earlier this year, FOH has been called to support the birth of a vocational training center for Burundian refugee women in Rwanda. 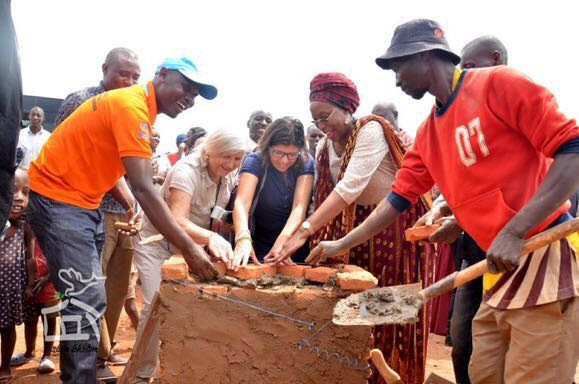 On January 3rd 2018, FOH laid down the foundation stone of a vocational training center in the Mahama refugee camp in Rwanda, where more than 60,000 burundian refugees live in very difficult conditions, among them 70% are women and children. Together with our board member, Mrs. Brigitte Burgisser, we visited the refugee camp in Mahama, 4 hours from Kigali. We participated to the new year festivity organized by Marguerite Barankitse, known internationally as the mother of Burundi. We saw old women bearing the weight of 2 civil wars in their eyes as well the loss of children, husbands and friends. We saw beautiful but desperate young women looking for an income for their children without being obliged to accept sexual proposals. We saw children with beautiful smiles showing their joy when they received even a simple orange. For those women we ask you to open your heart with generosity and empathy.